Unfortunately many exercise programs put too much focus on aerobic exercises and not enough on strengthening. As we age, our muscle mass diminishes and the best way to replace that lean muscle is strength training. You will all receive other benefits from your strength training program such as an increase in your bone density, leaner body (more muscle helps your body to burn calories), protects joints and helps with balance and flexibility. It also helps to improve your stamina…you will feel less fatigue. You’ll need to incorporate one simple 5-30 minute weight lifting program into your regular exercise program if you are not already working with weights. 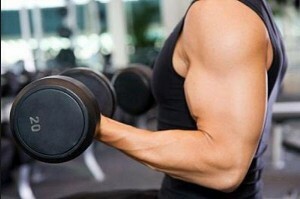 Perform enough repetitions that your muscles get exhausted. It is also important to remember not to use the same muscle group each day but to change it up because your muscles need to rest, recover and repair for a couple of days in-between. Research continues to show that there is a strong link between cancer and obesity. Body fat does not just sit…it actively alters the body’s normal hormonal and chemical balances. Even slim people can have high levels of fat around their internal organs. This fat is way more dangerous to our health than what we physically see in the mirror. Abdominal fat is a particular problem as it is metabolically active sending out chemicals such as insulin and proteins that urge cells to grow and divide at a rapid rate. High levels of these chemicals open the door for cancer to gain a foothold. The good news is that excess body fat can be burned off with proper exercising. Your exercise program needs to include 60% strength training and the rest needs to be vigorous cardio exercise that is challenging enough to raise your heart rate into the correct training zone. This speeds circulation of your antibodies through your body. Your body is not a weak machine. It was created with mechanisms in place that identify and destroy cancerous cells before they get out of control. The amino acid glutamine is the necessary fuel source used by most cells of the immune system and the primary area it gets stored in is the muscles. Having lean muscles allows for a larger glutamine supply which in turn boosts the system’s ability to detect and kill wicked cancerous cells before they take over and get a foothold. Getting stronger and fitter every day of your life should be your number one goal in life if you want to ward off the most frightening killer of all…cancer.